The Indigenous People of Biafra under the supreme leadership of Mazi Nnamdi are ready to drag it out with the Nigerian government in the court today. IPOB and the federal government of Nigeria’s case had earlier been postponed by the Nigerian Judge and were shifted to 18th of January by 1 p.m West African time. Barrister Maxwell Opara who spoke with Biafran journalists hinted on some of the intricate sessions of the background arguments, he pointed out that the pressures from IPOB is bringing undue heart failures to the inner caucuses of the Nigerian Government, apparently time is running out for Nigeria as the international community have a keen interest in Biafran agitation more than ever before. 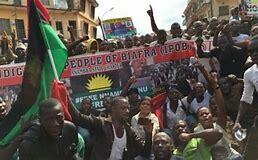 Nigerian elements are only trying to device further means to buy more time to enable them to come up with other strategies to silence or suppress the IPOB as it seems the current methods which includes the python dance, media propaganda are simply not working or probably bringing the desired results. Therefore the indigenous people of Biafra (IPOB) are encouraged not give up, but try to put more efforts and pressures on the system that holds them enslaved as by the time the final runs out of options or ideas then they will let go, also the option of fighting is no longer considered as a topmost priority due to high priority support it seems the table has inexplicably turned around in favor of Biafran’s and it's a win situation.